Atlanta (ATL) is the world’s busiest airport for aircraft movements, ahead of Chicago O’Hare (ORD). Both airports experienced a decline of 2.1% and 0.7% respectively. 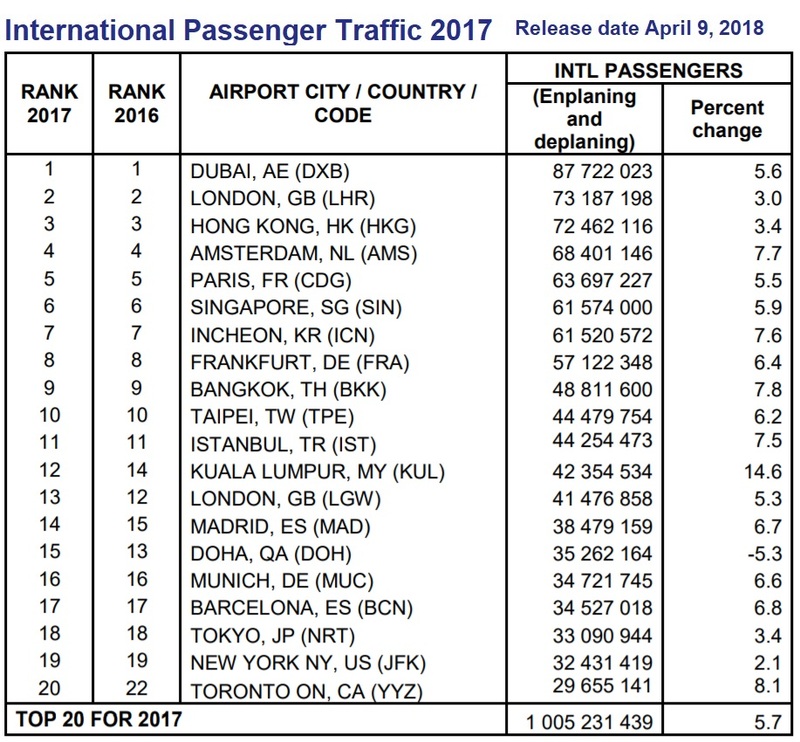 The top 20 airports inched up by only 0.5% year-over-year in 2017 as compared to 2016. Though there has been weaker growth in aircraft movements especially in certain North American and European markets following the Great Recession, this is consistent with the move toward consolidated operations and a curbing of capacity by aircraft operators to increase aircraft load factors and improve yields. Adoption of larger aircraft especially for long-haul operations has also contributed to this phenomenon especially among Middle Eastern and Asian airlines. Growing rapidly in relatively short period of time, India is poised to be one of the largest aviation markets in the world in the years to come. With an astounding population base of over 1.3 billion inhabitants, the move towards a more liberalized aviation market coupled with stronger economic fundamentals has helped to awaken the Bengal tiger to become one of the fastest growing markets in the world. 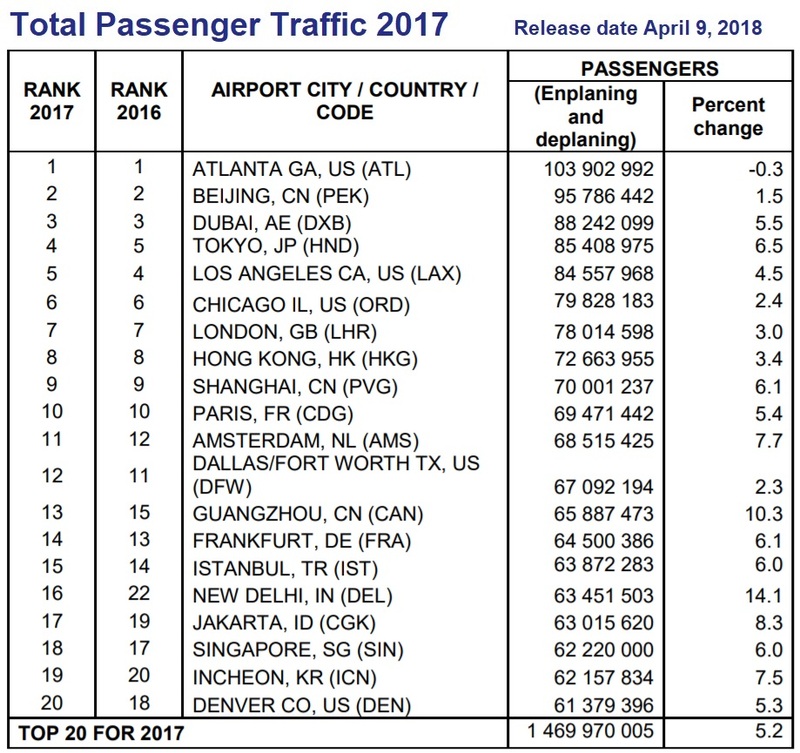 Delhi (DEL), the country’s busiest airport for passenger traffic, grew by 14.1% yearover year pushing it up from 22nd to the 16th busiest airport in the world. Calcutta (CCU), Hyderabad (HYD), Bangalore (BLR), Madras (MAA) also ranked among the fastest growing airports in the world. Year-over-year growth of 26.9%, 19.6%, 12.9% and 10.5% respectively was achieved in 2017. Chinese airports are the largest contributors to both passenger traffic and air cargo volumes growth. Boasting over 10 airports with over 20 million passengers per annum each, air transport demand continues to make large strides. 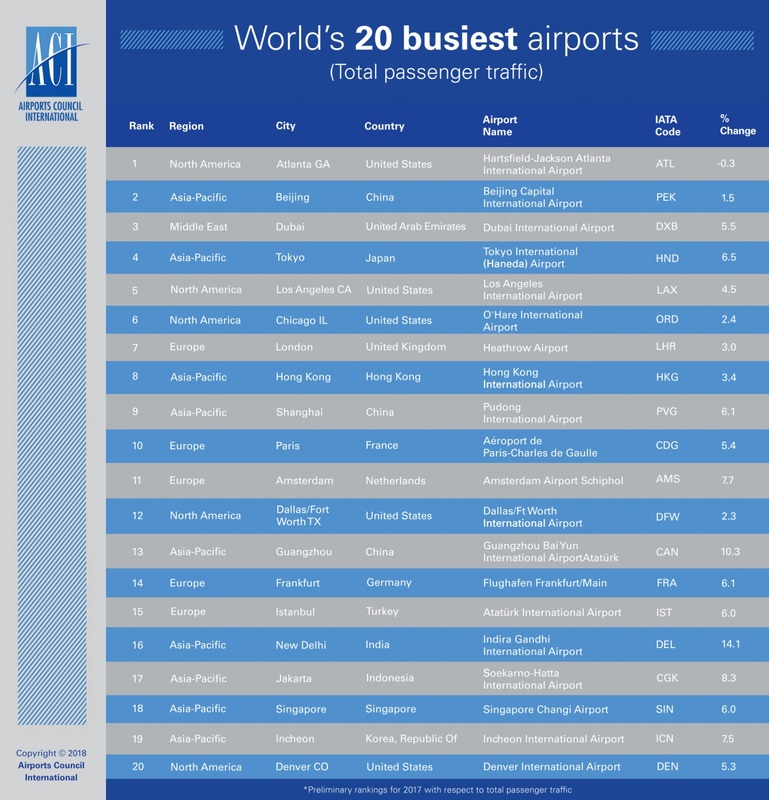 After Beijing (PEK) and Shanghai (PVG), Guangzhou (CAN) is the third busiest airport in China. Just shy of 66 million passengers in 2017, the airport accommodates China’s burgeoning domestic market. The airport’s total passenger traffic grew by 10.3% in 2017. Other Chinese airport hubs that occupy a significant proportion of domestic traffic also experienced double digit growth. Hangzhou (HGH), Xi’An (XIY), Nanjing (NKG) and Tianjin (TSN) grew by 12.6%, 13.2%, 15.5% and 24.5% respectively. The world’s largest air cargo hub continued to be Hong Kong (HKG), with a robust increase of 9.4%. 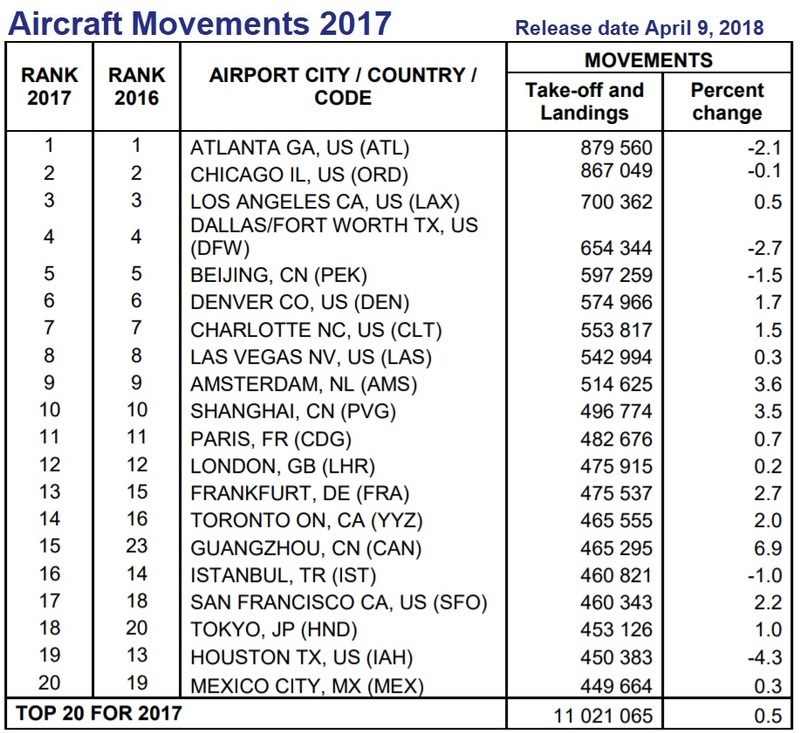 This was followed by Memphis (MEM, +0.3%), which was the only cargo hub to show a modest increase among the top 20 busiest airports. The airport is home to FedEx, a major express package delivery firm. Increased competition among express delivery companies has become a reality especially due to the inroads made by Amazon, a major e-commerce firm. The company occupies strategic airports in North America such as Cincinnati/Northern Kentucky International Airport (CVG), located in the Midwest for its operations. 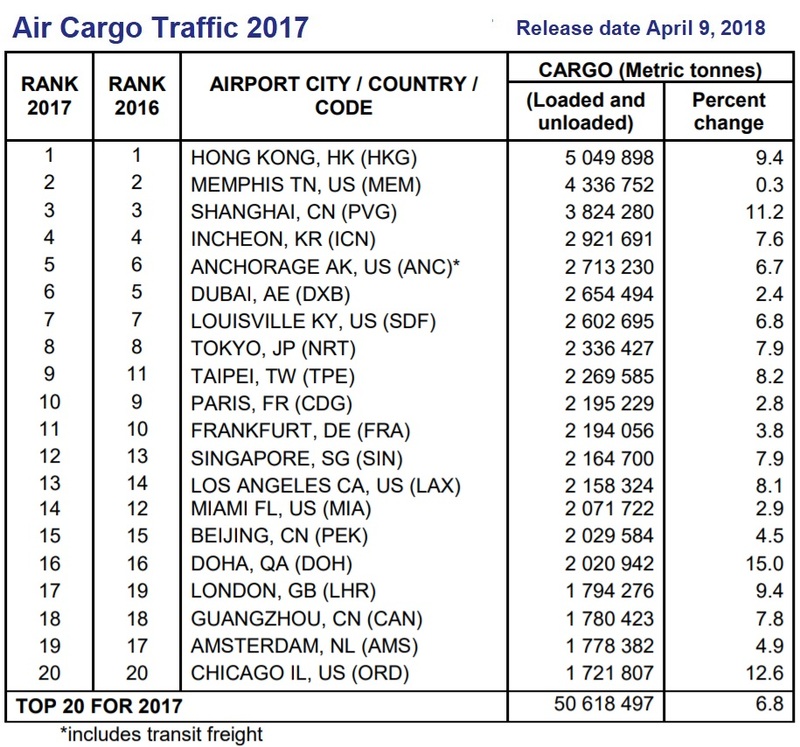 Even though Amazon’s air cargo facilities will not be operational until 2020, the airport is among the fastest growing in the world interms of air cargo volumes. CVG’s freight volumes grew by 27.3% in 2017. In Asia,Alibaba also continues to seize opportunities at regional hubs. The online retail giant centers its logistical operations at airports in China and recently Malaysia.